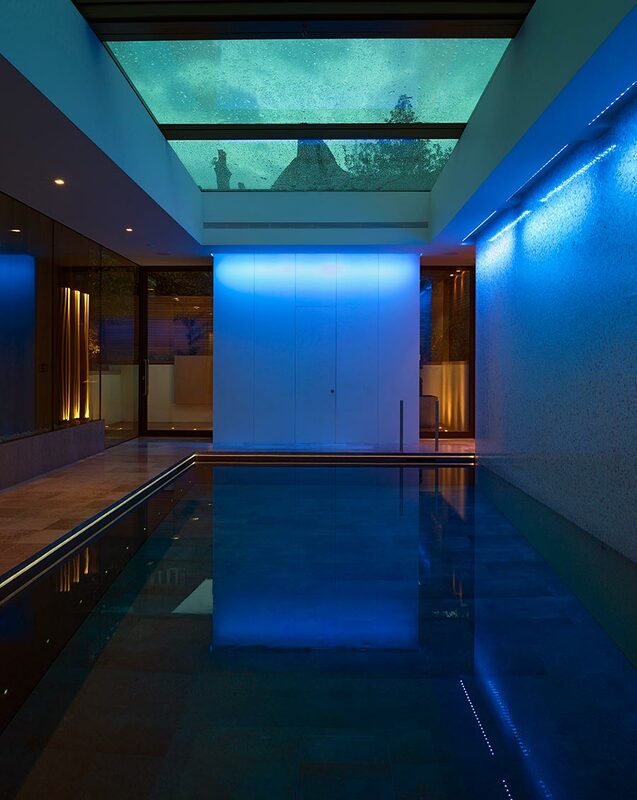 The inspiration for developing the stunning extension to the Grade 2 listed townhouse was the client’s love of natural light and the family’s affinity with water. This beautiful family home created the back drop for a contemporary extension that would allow their love of art, theatre and entertaining to set centre stage. 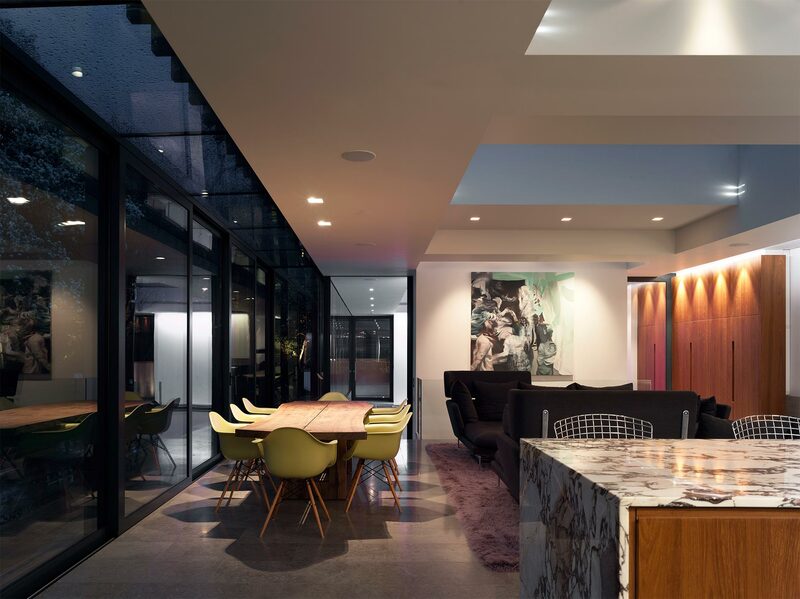 The design concepts included: maximising the use of daylight throughout, creating an efficient and maintenance free scheme and lastly to treat the pool room as a dynamic piece of art that would be continually viewed from the living room. The lighting design incorporated a multi-layered approach, concealing light sources in slots, furniture and shadow gaps to ensure discretion. Alan Higgs Architects, a full service architectural practice with whom the clients had worked with extensively previously was asked to design the extension including a kitchen that was an optimal environment for a serious cook, a relaxed family living area with fireplace and an underground wine cellar with controlled environment. The deep indoor swimming pool with rising floor allowed transformation into a room for games, parties and cinema. The internal spaces are flooded with natural light and allow a close connection to the garden, changing skies and the sun’s passage. Materials include stone, marble, teak and mosaics, all forming a cohesive whole. The clients love of art and enormous respect for some of the world’s greatest lighting artists led to a natural discussion of James Turrell and his use of lighting spaces to create site specific installations. 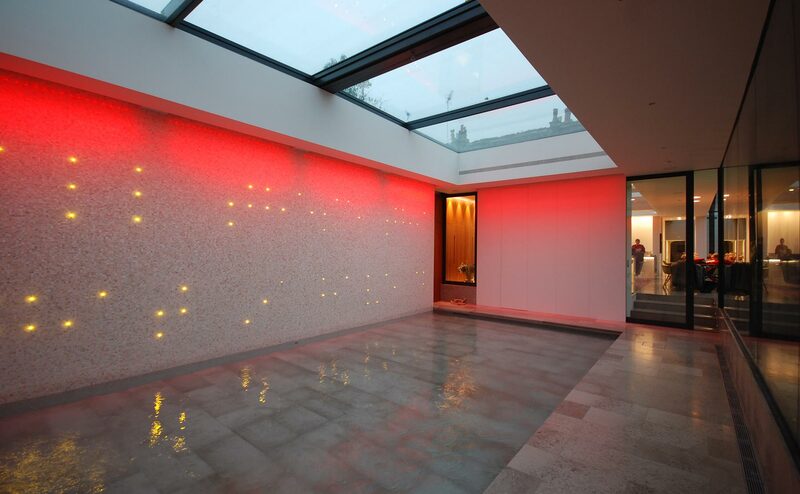 The quirk of the lighting piece was when the clients favourite saying ‘All these things that we have done’ was translated into Braille and then placed as light points within the mother of pearl mosaic wall. The sentence sparkles and shimmers a thousand times in reflections. 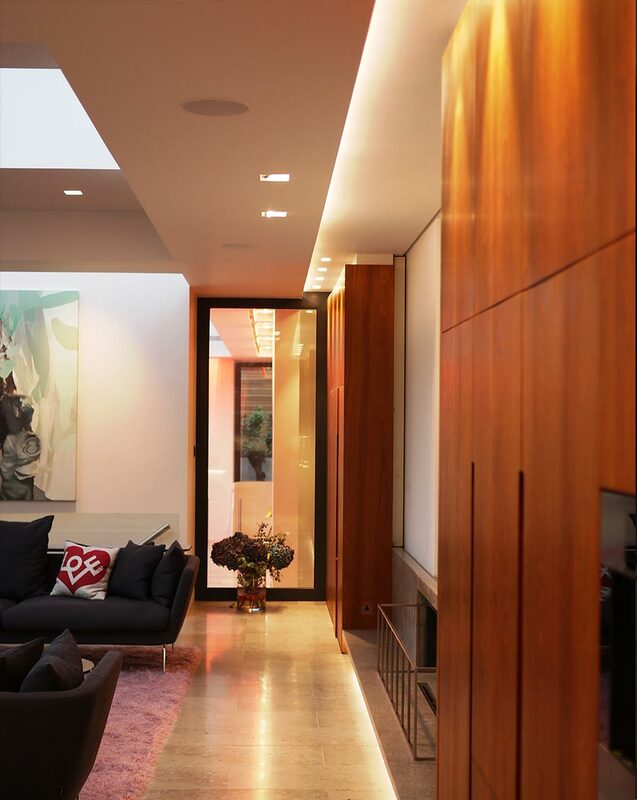 To further embrace the client’s love of colour as well as to compliment the interior space linear lighting was slotted in to the deck boards to create a personal linear ‘skyline’. Meticulous attention to detail was observed at every stage of the project to ensure a seamless integration of the desired effect. This is a fun, sophisticated living environment for a fast moving family that regards their bravery by embracing such cutting-edge design. They are truly a dream client. As Rebecca Weir, Design Director of Light IQ states, these clients come along once in a blue moon and are a wonderful tribute to our work. The project has been a finalist in many International Lighting Awards, recognising its cutting edge design and close collaboration for all involved.